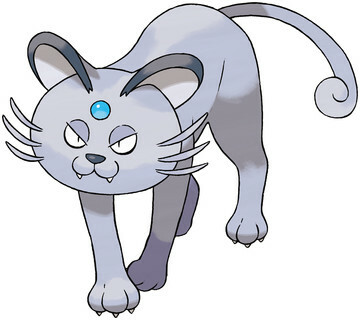 If you have a good moveset for Persian Alola Form, post an answer below and upvote the best ones. Remember, this is for competitive movesets, not in-game. Ability, EVs etc should be included, and we encourage sets for VGC doubles as well as singles. Make sure to read all the guidelines here. Alolan Persian Pokedex & learnset for reference. Play Rough is for dealing with Fighting-type Pokemon. Also, if a Fighting-type does get to attack, Persian has the ability Fur Coat which reduces damage taken from physical attacks, since most fighting typed moves are physical. U-Turn is for if you need to switch switch out Persian quickly. I picked Night Slash for this moveset because it is good for a Pokemon to know at least one of the moves of its type. I didn't pick Dark Pulse because it is not a physical move, and that way it would be easier to put all of Persian's strength in attack rather than splitting up her strength into Attack and Special Attack. Toxic is for if Persian is battling against a bulky Pokemon. Leftover's is just a good item to have. It will help restore Persian's HP, while, if she has used Toxic, the other Pokemon is losing it. This set is the sweeper variant, which is the most common. Snarl is for it's STAB, Hidden Power Ice is for coverage, Parting Shot is to cripple the opponent and pressures a switch, and also allows you to switch as well. Nasty Plot changes Persians normally mediocre special attack stats into a powerful threat. Is it hidden power flying or ice? you said both but it can only have one or the other. Let's take a look at this set. I mean, Persian isn't a really viable PU mon but this moveset is still here. EV Spread, The EV Spread is for having a Persian that Hits Hard and takes Hits well. The nature depends on what Persian you want, Bold for Tanky, Modest for Sweeper. The abilities work same as the Natures. Fur coat for Tanky, Technician for Sweeper. Leftovers are for recovery. This fat cat can't take hits well. Nasty Plot is for Massive Sp. Atk. Snarl for Technician Boost STAB attack. HP Flying is Technician Boost Coverage, T-Bolt for Powerful move or, if your opponent threatens you with a Devastating move, use Parting Shot. I recommend Parting Shot. Nasty Plot boosts Special Attack, Dark Pulse or Snarl would be your Main Dark STAB depending on your preference on Secondary Effects. Power Gem hits Bug, Fire, Flying and Ice types super effectively, while Thunderbolt hits Water and Flying Pokemon super Effectively. Water Pulse hits Ground, Fire and Rock types super effectively. HP Fire hits Steel and Grass types super effectively. Only two you will want to change when it levels up is replace Uproar with power Gem, And Replace Work up with Nasty Plot. Work up you get as your first TM so you should be able to learn it right away. You can get Uproar fairly early too after you beat Kahuna Hala and get enough BP. You need at least 8 BP To learn Uproar. This move can be found at Big wave beach just talk to the woman in the bikini in the hut and trade in your BP for Move tutor moves. Foul Play is a move you can only get as an egg move or the battle tree so you will have to beat the game in order to get it yourself. But you can always trade with your friends who beaten the game to get U-turn and Foul Play on your persian for you. What is a good moveset for Persian? What is a good moveset for Alolan Muk? What is a good moveset for Alolan Marowak?